This is really no joke, we face the biggest challenge humanity has ever had to face and only a 16 year old young woman is brave enough to confront the world with its own hubris. Somehow, collectively we have managed to push to the back of our minds the thing we have officially known since 1992 Rio Earth summit; we are on the wrong path for development. 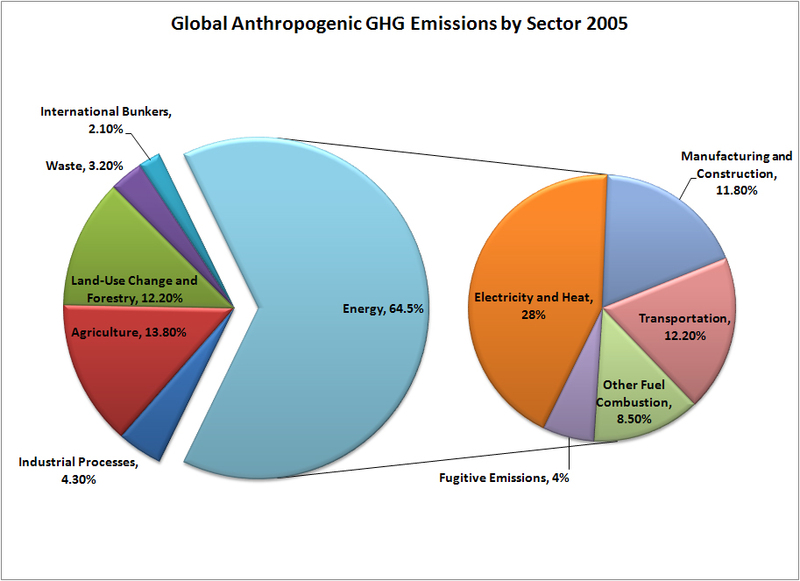 Since then global emissions have risen by over 60%, we have not taken notice and consequently “our house is on fire”. We have overlooked these early warnings for short term gain and the consequences of that are about to confront us in the most forceful way. The time for urgent action is here and around the country, around the world people are coming together to explore, develop and scale up their responses to the unfolding crisis. Currently climate action feels directly opposed to the forces of capital and government who seem unable to grasp the deficiencies of their own short term-ism, but a tidal wave of change is brewing. I suspect those same government and corporate elites are going to be dragged by the masses into the stark realities of the 21st century. We can fix this, but not with the current regimes in charge. We need a root and branch change and that is going to be defined by democratic, bottom-up and inclusive processes centered on ecological realities and priorities. At this time of crisis we need decisions informed by science not market forces and a political ideology that has run its course. The infamous hockey stick graph, the original warning that we were already living well outside of historic CO2 levels. Michael Mann who produced this remains a leading climate scientist an urgent and informed voice we need to pay attention to. If this doesn’t alarm you then you really have not been paying attention, do the research. Energy, agriculture and land use can be rapidly transformed. This is twice the temperature that you would expect at this time of year, imagine if this was the summer and we had an extreme event that raised the temperature to twice what it would normally be then people would be very worried indeed, you wouldn’t be able to go out. The single most impactful thing to do right now would be to increase the energy efficiency of the homes we have, both the ones we are building new, and the ones that we have already got. We should make it impossible to have new homes built that aren’t carbon neutral. What we are beginning to discover is the more you do to decarbonise the economy the more you are able to lower energy bills. People in the energy community are beginning to get the message. The financial community really has picked up very strongly on the risks associated with climate change. But I think we need governments to really listen to what our children are saying to us, and treat this as an emergency. They need to do a lot more, and do it a lot quicker. 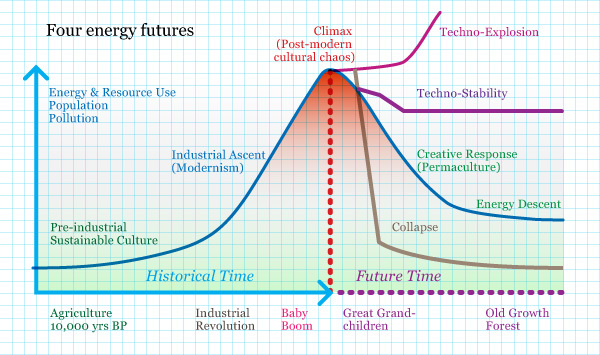 Adapted from David Holmgren’s future scenarios. Carrying on as we are will definitely lead to a sudden and catastrophic collapse, the path to sustainable development is already way too to late to follow and the only remaining pathway open to us is a planned descent, as quickly as we possible can. It is essential that we understand and act on this as urgently as we can. Its all about priorities. We need to tackle things in the right order. Start small, start locally , start with what you have, start now but also collectively we have to look to the low hanging fruit. Where are the areas where we can quickly make a big difference? The easiest to implement, the easiest to duplicate, spot the trends and get ahead of the curve. Boxing up plastic wrappers and switching out your light bulbs is all well and good but it is still only slowing down the rate of destruction not stopping it. To fix this we have to rebuild, regenerate natural ecosystem, protect the wild places, take the sheep down form the mountain tops and let them regenerate rapidly. Insulate homes, work out how to share things much better, make every car a taxi of some sort. The list goes on but these are the conversations we are required to have and it is only by taking part that will get the outcomes we want. Since then I have taught 100’s of students in that time, many of whom have gone on to initiate permaculture projects and communities around the world. I have build a huge web of contacts and experience and I really have come to know just how well it works and how adaptable permaculture is to different situations. I Say it again, We can do this, we can repair much of the damage that has been done but we need a clear run at it, we need government and business behind us, not in the way. We need communities to come together to listen and learn, be ready to take on new ideas and become part of what will be the most amazing transformation of society. 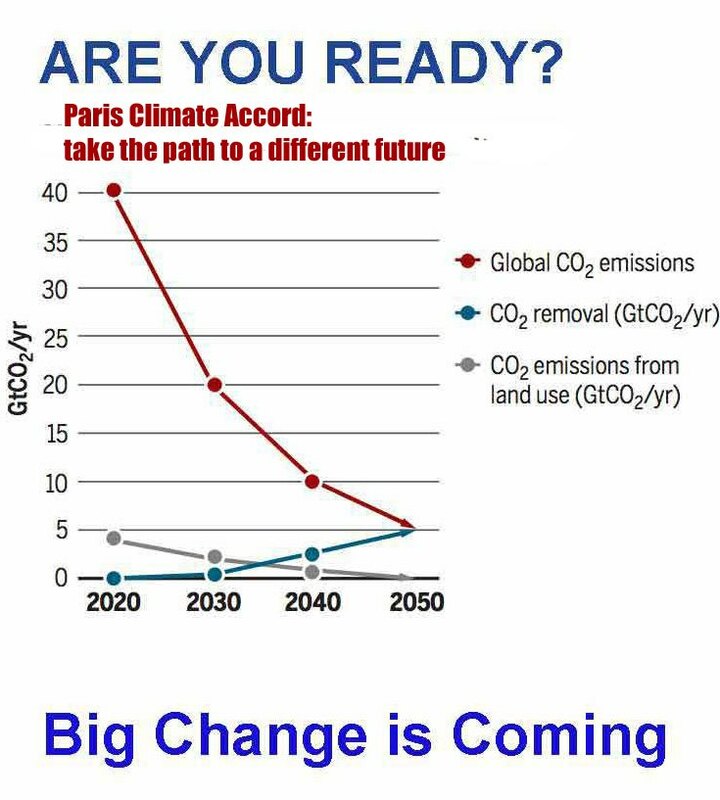 This is a 30 year process we are looking, we need to plot a steeper curve that the one agreed in Paris Accord and that begins with halving emissions in this decade. So lets get busy! 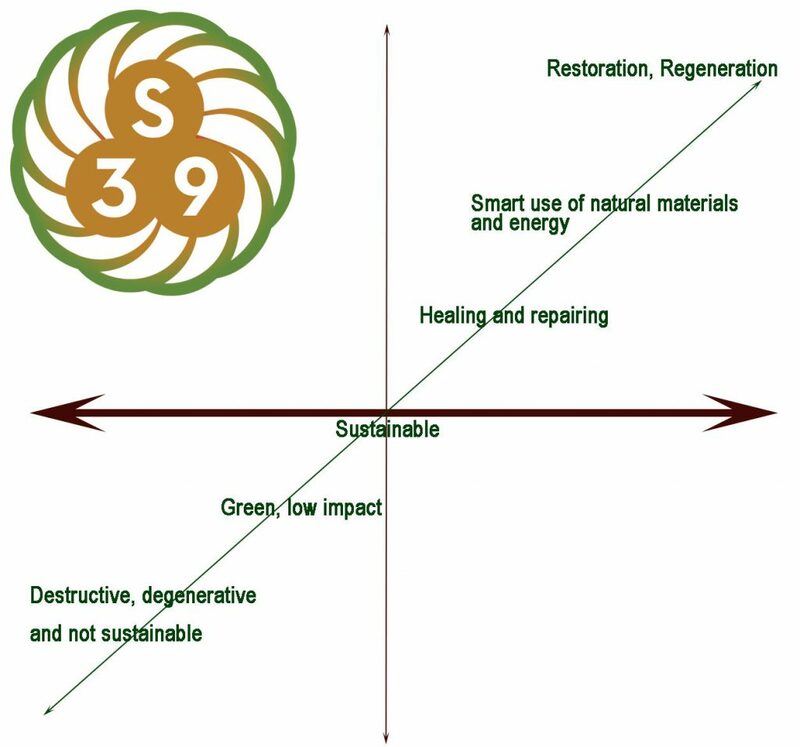 I have said it before and I will say it again, permaculture is the answer.